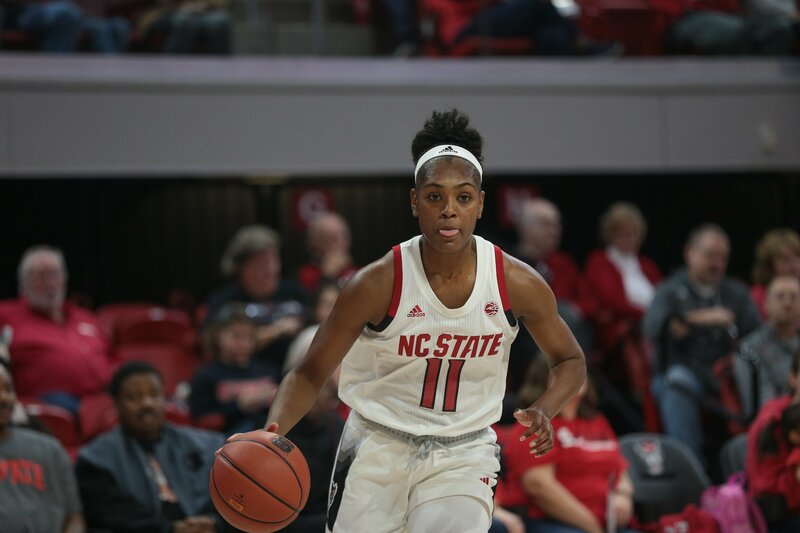 Kiara Leslie had a double-double in North Carolina State’s win Sunday, to cap off a strong week. Photo courtesy of North Carolina Athletics. Week 2 in the ACC provided stark clarification and muddled waters in equal measure. Teams are settling into the grind of the season, but there are still plenty of questions. Notre Dame continued being Notre Dame. The No. 1 Irish beat Penn 75-55, then rolled No. 15 DePaul, 101-77, in their first remotely serious game of the year. So far their average margin of victory is 29.7 points, and they honestly haven’t had to break much of a sweat to get there. 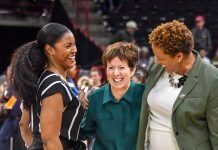 Coach Muffet McGraw witnessed one tiny speed bump on Saturday, as DePaul led her team 29-22 after the first quarter. Then Notre Dame put the steamroller in gear, flattened that speed bump and notched a dominant road victory. Again: the best fight the Blue Demons gave the defending champs wound up a 24-point Notre Dame win that was never in doubt after halftime. Syracuse rebounded from their loss to Oregon last weekend with dominant victories over No. 20 Texas A&M and Bucknell by a combined 145-121 scoring margin. The Orange continue to ride dominant turns from a deep roster to wins. No. 5 Louisville did not play a game this week, so the Cardinals remain undefeated at 2-0. No. 17 North Carolina State are sitting at 4-0 after smoking Vanderbilt, 74-54, and Radford, 75-58. The Wolfpack have scored over 70 in every game this year, leading to comfortable double-digit victories each time. Sunday’s win over Radford featured monster performances from Kiara Leslie (14 points, 14 rebounds) and Elissa Cunane (23 points and four boards off the bench.) Coach Wes Moore continues to pull great play out of a roster still trying to find its identity. At times this team feels like it’s hanging on with gritted teeth and barbed wire, but they continue to clock w’s on the strength of timely buckets and solid decision making. Virginia Tech remains a perfect 4-0 as well, having downed Liberty 72-61 on the road and then obliterating Monmouth in Blacksburg, 82-49. Offensively, this team has been deeply-impressive thus far, both in volume and efficiency. The Hokies are averaging a tidy 82 points a game on .463/.391/.754 shooting splits. Their +31.0 scoring margin is good for 27th in the nation and second in the conference behind only Notre Dame (+32.5). Dara Mabrey is having a spectacular debut season (can’t call it a surprise or a breakout given her pedigree). The freshman is shooting .622 from the floor, .846 from the stripe, and a jaw-dropping .571 from deep. Her per-game stats so far: 17.3 ppg, 4 apg, 3.5 rpg, and one pocket picked a night thrown in for good measure. This team is dangerous, full stop. Boston College was predicted to finish at the bottom of the ACC this year under new head coach Joanna Bernabei-McNamee. So far, the Eagles are playing like they either never heard those predictions or they flat-out don’t care who made them or why. This week, BC crushed Holy Cross 89-63 at home, then took a hard-fought 64-57 road win at Houston. 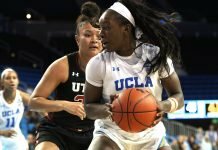 They continue to rebound at an intimidating clip, but don’t lose track of the fact that all the glass-cleaning is turning into buckets in a balanced scoring attack. Three players are averaging 13+ points (Makayla Dickens 13.0, Emma Guy 15.0, Marnelle Garraud 15.3) and three more are kicking in 7+. This team won’t necessarily make national waves this year, but they look well ahead of schedule in terms of proof of concept moving forward. Clemson’s lone contest of the week is best categorized as a dignified loss. No team wants to drop a game against their fiercest in-state rival, but there’s no shame in a 57-69 road defeat at No. 10 South Carolina. The Tigers (2-1) made a game of it, cutting a 21-point Gamecock lead down to striking distance in the third quarter, but they ultimately didn’t have the firepower to complete the comeback. There were some notable positives despite the outcome, however. 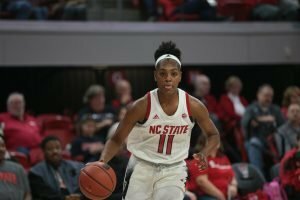 Danielle Edwards, Simone Westbrook, and Kobi Thornton continue to propel the offense, as all three rang up double-figure scoring against South Carolina. Problem: Clemson had only six total assists in the game, and no other player on the roster scored more than six points. The difficulty coach Amanda Butler’s squad faces this year, at least so far, is getting that core some help. Any help at all, really. Florida State finally stumbled. After putting up dominant wins over all comers so far, (including Thursday’s 79-46 thrashing of Jacksonville), the Seminoles suffered a 58-45 loss at the hands of LSU on Sunday. Outside of junior guard Nausia Woolfolk, no ‘Noles player touched double figures in scoring in defeat. FSU needs more offensive production. Wake Forest also took their first loss, dropping them to 3-1 on the year. Losing by seven on the road at VCU isn’t horrible, but it’s not great, either. The Deacs have every reason to believe they can still rise up and take out some conference foes, but this was a game they coudl and probably should have won. No. 24 Miami notched a solid 63-55 win over No. 19 Marquette, but followed that up with a 75-52 loss at Iowa State. The ‘Canes looked like they meant business coming into this week, but getting run by 20+ in Ames didn’t do them any favors. This team has the talent hang with top 25 rosters, but will need to figure out how to close and stay engaged more consistently if they want to make a tangible impact going forward. North Carolina caught their first loss of the year on the road in Boulder Sunday at the hands of the Buffs. Janelle Bailey continues to be impressive, and transfer Shayla Bennett is making some superb hay, but the Tar Heels finally found a contest they couldn’t win when their talented cast failed to execute. They ousted VCU 59-47 earlier in the week, but didn’t have the cohesion to survive a west-coast trip in what has been an erratic early-season travel schedule. They certainly have the depth and firepower to right the ship, but this was not the result they were looking for heading into the Thanksgiving week’s Paradise Jam tournament. Duke is struggling early. The Blue Devils logged a dominant 81-64 win over Elon on Sunday, but before that, they barely eeked out a 66-63 contest over Maine. This is a team that needs to come together quickly. Synergy is something head coach Joanna P. McCallie has always excelled at, but she and her team need to find it soon. Georgia Tech housed Western Carolina 84-49, then executed a stunning upset over No. 14 Georgia with a 63-53 win at home. The Yellow Jackets have been on a roll since dropping their season opener, and ousting a ranked team will only help. Tech is young, but they show great promise. Keep an eye in particular on sophomore Lorela Cubaj, who had a breakout game against the Bulldogs, and might be something special. Pitt created a near-exact replica of their week 1 results: a fairly close loss (55-46 vs. Youngstown State) followed by a fairly dominant win (65-48 over Cincinnati). 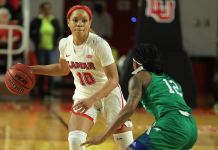 Seniors Aysia Bugg and Cassidy Walsh are averaging a combined 28.8 points and 7.25 assists per game, but the rest of Lance White’s roster simply doesn’t appear capable of helping them all that much. The Panthers can probably steal a few games they ought to lose if Bugg and Walsh are really cooking and another teammate or two has a random unconscious shooting night. Beyond that, don’t expect much out of the squad from the Steel City this year. Virginia got their first win of the year in. The Hoos topped Old Dominion 73-67. This team will play ACC basktball this year, but there isn’t much to say beyond that.